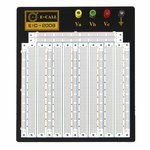 A set of 22 AWG solid wires (350 pcs.) 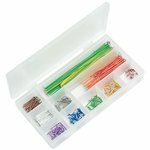 containing wires of 14 lengths and different colors (25 pcs. each). 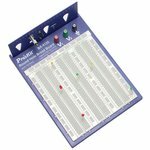 The edge plate can easy fold up (convenience your work): 1580 tie points; Round hole designed for easy plug and pull; Expandable by combining several boards together to meet your different requirement. A set of 22 AWG solid wires (70 pcs.) 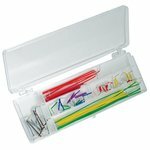 containing wires of 14 lengths and different colors (5 pcs. each). 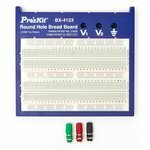 Round hole designed for easy plug and pull; 840 tie points; Expandable by combining several boards together to meet your different requirement. Used as a simulated layout for R&D and students. The edge plate can easy fold up (convenient work). 2420 tie points. Round hole designed for easy plug and pull. 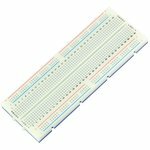 Used to build and test prototype circuits quickly before finalizing any circuit design.